Picking branches is like picking stocks and around here we usually avoid that... And the expense ratio will significantly eat away at your returns over time. what would be more worth it for me. B. Putting it into a Roth IRA? I kind of want to get debt free (though I also need to make sure to get more credit cards so my credit score doesn't take to much of a hit for paying off my loans) but if it's significantly better to go with the IRA I could likely swing that route past my wife. Mathematically it depends on the interest rate of the loan. I can understand the personal desire to be debt free. Investing is significantly about time. The earlier you can start investing the better Time is your friend. I tried to remove the question of interest rate by outright saying how much it would save me in interest :P it's around 7% on the student loan though. At 7% I would say it's a wash, paying down your debt is guaranteeing that return in these uncertain times. At 7%, I would pay down my debt first. Especially how the market is likely to go in next year. Personally I got a lot of 'good debt' (debt to things that earn me interest at a higher ratio that the debt, investment properties) but I always try to pay down debt that have a higher interest or close to what than what I could expect to earn long term if you factor in taxes. 7% is not good enough an interest compared to what you'll earn if you invest it. Once you paid your debt more that portion of the budget into saving, you won't notice the difference in cash flow. At 7% it's not even a question for me, pay down the debt first. I usually lean in the direction of paying off debt even if it may not mathematically make perfect sense. Having the weight of debt gone is a big win and of course it's a guaranteed return. Although I've never actually held debt myself so maybe I don't know what I'm talking about. Anyway, beginning of the year! Fill up those TFSAs and IRAs! My wife and I put in our $6,000 each for the year on Jan. 2nd, we like to get an early start. Not entirely sure but we may be able to get close to filling the remainder of her tax shelter room by the end of this year as I filled up all my RRSP and TFSA room for the first time last year. An annoying point is that my stock grants which were granted at a value of around $50k CAD have now dropped to almost half that. I got them granted at an inconvenient time it appears! I still might just sell them as soon as they vest but it's a hard thing to do when I know that EA looks to be able to bounce back fairly easily. So, I am building my Roth IRA portfolio and have been reading a variety of articles regarding diversity and when it becomes too much, to which Forbes and a few others seem to believe that 20 securities will be the sweet spot and 30+ is far too many. Right now, I am at 18 securities in different sectors that I believe will thrive in the next 10-20 years and wondering what you all think about how many companies you should hold stock in at a given time? My portfolio is 70/30 with stocks and bonds (of which are local municipal, short-term corporate and intermediate government). If you're picking specific sectors, you're saying you know better than the stock market, so expect underperformance. If you're the type of a person who sells investments when they do poorly compared to total market holdings, then I'd strongly suggest not going there. People used to recommend REITs as a fourth fund, but not so much anymore since they act like stocks. Publicly owned REITs are a bad deal compared to privately listed ones. Focus on saving first then worrying about different investments later when you have a sizable amount. You may not want to deviate market strategy then. Keep it simple. Complexity doesn't mean better returns especially the further you deviate from market holdings. You will see a simple portfolio is beautiful. Finally initiated the transfer for the IRA, have to wait 3 days now, boo. Why bother with a bunch of individual stocks and not just one ETF? So, it’s better to go with ETF’s over single stocks with a lot of diversity? I’m just trying to make sure, as I tend to overlook these things. I’m just trying to take the safest route, but also something that will produce the results I hope for. Sorry for my newbie questions. Thanks for all of the responses. I was planning on paying the debt, but I wanted to make sure I wasn't missing anything. I already know my credit will take a bit of a hit by paying it off since it's my oldest credit line by a large margin, but I'm hoping to negate that by opening a few more higher limit credit cards over the next 2 years. 835 is excellent credit. Don't worry about it unless you need to pad your ego. 750+ is all you need. I'm just trying to make sure I stay as high as possible as aside from saving for retirement one of the next steps after paying off my student loans is likely buying a house, and having as good of credit as I can for that can only help save me money in the long run. I mean, if you think about it, there's nothing more diverse than a whole market ETF. Now of course if you do that (which we recommend) you'll be getting what the overall market is getting. If you want to try and beat the market by stock picking I say good luck to you. That is the way to do it but of course you're also massively increasing your risk of taking huge loses above what the market gets. Ok guys I need help to understand something that is probably simple: if you borrow for a mortgage at a variable rate, open (meaning you can repay it all without penalty at any time), what interest do you actually have to repay? Is the total the same than if I hadn't repaid early (assuming interest rates stayed the same), or do I not have to pay interest on the balance, and only paid interest up to the moment I repaid the loan? Like let's say I borrow 100k, and repay it tomorrow, I assume I would have only to pay 100k + the day's interest, so basically 100k and a few dollars? Or is paying the full loan if it's open only a protection against a potential rise in interest rates, so you have to pay the total determined by the amortization period and current interest rates? Depends on the terms but in most cases it's the former. So, I finally made the leap and opened an account with Vanguard and made my first ETF purchase. Feels really good to start this process. Wish I had decided to do this a while ago but better late than never. -Husband's 401(k) contributions have been doubled from 8% to 16%. His company matches 4%. So that's 20% of his salary. I'm hoping to convince him to contribute to the max at some point, which would only be a few thousand more. But even an 8% increase is huge so I'll consider it a big win anyway. -Both of our Roths have been maxed out for this year. I don't have a 401(k) because I only work part time and thus don't qualify for my employer's. The Roths probably add up to about 9% of our family's gross income. So that's around 29% of our gross income going into retirement. -Just closed out our Capital One 360 savings account, which was only earning 1%, and moved it all to our local bank where we have our checking account. They have a high-yield savings account that is fully backed by the FDIC that earns 2.5% for balances over $5k. So that means our savings will be earning close to inflation. And we'll now have instant transfers between checking and savings, meaning I'll be able to put in money as needed into each account as necessary without waiting and can earn the max interest on our money. -That being said we are not going to invest non-retirement money into the stock market/index funds. We are both too risk-averse for that. But at least we'll be earning 2.5% instead of 0-1% on our cash. For people in Canada, look at VGRO, VBAL, and VCNS. They are Vanguard’s one-fund solutions and and I have move essentially all my investments to a mix of VGRO and VCNS. Might move all to VBAL eventually but I wanted a bit more growth for now. Just found out today that I have a whopping 17 shares on AT&T stock and have had them since at least 2009. Apparently I've been getting 8.00ish dividend checks for years and never cashed them obviously. Computershare is gonna mail me a $106 check. I'll probably just use it to buy a few more shares so I can get to 20 even. I don't know how I got this stock. John Bogle has passed away. RIP. Reading the article, he had a heart attack at 31, and that was only the first of six. And he lasted until 89. Damn. Glad he was able to last that long and bring us dem sweet, sweet index funds. My wife and I paid off our mortgage last year, 12 years into the 30-year loan. We did this as a key part of our retirement strategy, so I thought I'd post about it here; those who migrated from the old digs might remember me posting about paying down a mortgage vs. saving for retirement, including when we first decided to really pick up the pace. I thought I'd post about how we fell about it now, and if we'd do it the same way again. First, a caveat: I'm not advocating everyone do this; a LOT of variables go into this kind of thing, as with all savings strategies. I just want to explain why it made sense for us. As light background, I grew up in a household that was pretty much crushed by debt, especially after my parents divorce. I went into finance in college, and came out with a strong predisposition against debt as a result. I remember my mom talking about how she would try to pay a bit extra on her mortgage each month, as she had worked out how much faster she and my dad could pay off the house if the did. That never panned out, but the financial lesson seems to have stuck. I went into the loan wanting to pay it off early, but never at the (full) expense of retirement savings. 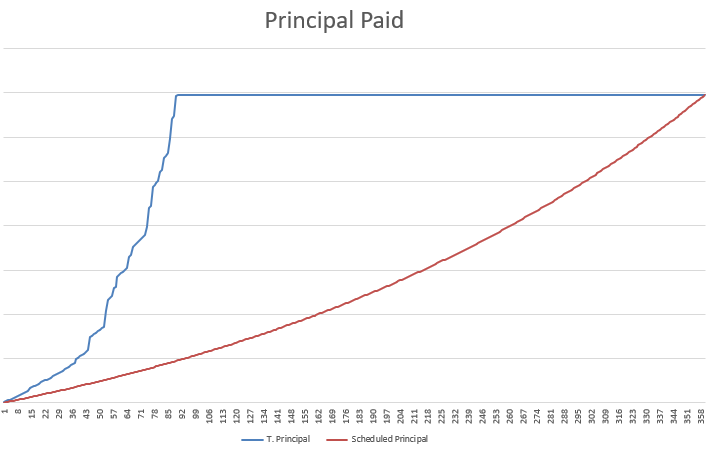 My wife and I roughly split up saving for retirement, and other savings, and paying the mortgage down as a 75/25 split, because we knew how important it was to start retirement savings early. (My wife and I actually started our Roth IRA's when I was in college, with $25/month going into each.) Every time I got a raise, we put a bit more into every bucket, including paying down the loan. I basically made our mortgage payments the fixed return portion of our savings strategy: the return was the rate of the loan, which started off over 6%, refinanced down to ~4.5% a few years later, after the crash. When we refinanced, we decided to just keep paying the same amount on the loan we had been all along, so that little bit extra every month turned into a LOT extra. And that started to add up fast. I decided that 4.5% return was decent enough to make some financial sense, even if the raw math favored investing over the long term. We are 100% invested in stocks in our retirement funds, so that reasoning helped me consider our "portfolio" of savings/debt payments as somewhat balanced. The other angle was, I wasn't sure I wanted to keep doing what I was doing all that much longer. I liked the idea of changing careers, and possibly really reducing our income, without having to worry about a mortgage payment. About four years ago, when I started thinking about perhaps moving on, we realized we could take the company stock we got each year and instead of putting it in our IRA, we could basically pay off the house, potentially freeing me up to get out of corporate America. That's basically what we did, though we paid it off a year earlier by drawing down the number of shares of stock we were holding onto. Now that it's done, I'm going to try and work another 3 years, during which we can power-save, and then semi-retire. On balance, I think it's worked out well and I'm not sure I'd change much. We definitely lived more frugally than we might have otherwise, and skipped on a few big family vacations we might have taken if we could do it over again. And retirement would be much larger now, given what the markets did coming out of the great recession. I think we might have done for a slightly different balance if we did it all over again. But now that it's paid off? We are not sad about having no mortgage each month. Not sad at all. I kept two graphs as we tracked our progress. The first is just a comparison of the principal we'd paid as compared to the normal 30-year pace of the loan. 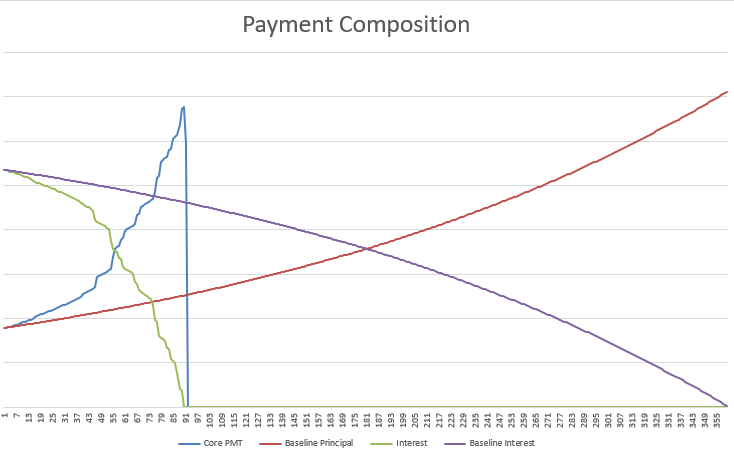 This graph is the monthly composition of the core loan payment - how much of each payment was principal vs. interest. What I liked about it, that vertical line formed by the principal line would move to the left each time we put any extra on the month. When I did our month-end finances, I looked forward to that line moving over a bit; it became oddly, hugely motivating, seeing progress happen every month. Now ask yourselves where you would be if you had been power saving and renting instead of getting a mortgage. I did the real maths recently, factoring ALL actual housing costs like interest, taxes, renovations, insurance, with a growth of 4% a year on the house, for 20 years. I was better off renting, especially when you take into account the other benefits of renting. Also it’s likely that housing won’t grow 4% on average for 20 years here, but a balanced portfolio could or even outperform that. I’m currently looking for a place to buy, but prices are too high so I might keep renting and keep on saving and catch a house when markets tank, which they inevitably will eventually. I'm pretty sure we saved over $100k in interest by paying off our mortgage early. This was while contributing the max to my Roth and my husband contributing up to the max match in his 401(k). Once we dumped the mortgage, we've been slowly increasing our retirement savings and now it's close to 30% of our gross income. This is very true, though I personally consider rent vs. buy more of a lifestyle choice than a financial one, though finances are a factor. I wouldn't trade my woodworking shop, our chickens, yard, renovations (adding cost, but also comfort and fun) for the money saved by renting, but that's for everyone to decide on their own. Our retirement would probably be ~50% higher than it is had we not paid the mortgage down early. I think there's a strong argument that doing so would be better, financially, as that would keep growing and compounding. But I am finding we really like the freedom of being out from under the loan as well. The advantage that provides is I can make some lifestyle changes now, nearly 20 years before we can access retirement savings, while focusing on retirement would have meant a great retirement but I'd be feeling pretty trapped right now at my job in the meantime. Definitely another call that is as much a lifestyle decision as a financial one. Congrats GhaleonEB, that is a huge achievement! Yeah a lot of people point at the rent vs. buy from a financial decision perspective, which I think is still a good perspective to take, but it's not the only consideration to make. The snarks over at Millenial Revolution are always like "LOL NO, IT'S A FINANCIAL DECISION" which is fine for them as they're permanent nomads and it wouldn't make sense for them to buy at all, but that's not the kind of life I want. At a certain point it's close enough financially that it becomes a lifestyle decision. If I have to work 2-3 more years but I can do it in a place I own, I'm ok with that. We're moving from Vancouver because the rent is sky-high and purchasing is not even close to possibility. We're heading to Ottawa where our mortgage payments + other costs will still be less than our Vancouver rent. Obviously the comparison is even more favorable if we did the proper Ottawa rent vs. Vancouver rent thing. But I'm sick of renting, I want more control over how I live and the quality of what we live with. Landlords will always stick to the minimum of "if it functions, it's ok", because they're not invested in the same way in a place they don't personally live in. Paying off your mortgage and only dealing with property taxes, and possibly assessments is a great feeling. These totalled is a fraction of what rent would be. That being said buying makes no sense if you are still needing/wanting to move around or upgrade or downsize in the near future. Congratz on being mortgage free. It does feel good to have your house repaid. As for the debate of renting vs home ownership it really depends on what type of housing you would rent vs own. If you are living in an apartment and moving to a single family home then probably financially (if you set the same amount of money you would put more in a house) you would probably be better off financially. For equal housing units (same size, same type) though, in most market IF your not planning to move for a long time, I disagree that you are better off renting. They are some markets though where it's not true especially if there is a housing bubble. I would consider Vancouver as above as a market I would consider buying risky. Toronto would be bordering on risky. Ottawa or Montréal are definitely much safer markets (I don't know enough current status on the US markets to use them as examples). Now for the question of paying your mortgage early, for most people I do agree with you that it's probably better to pay it off sooner than the term. Most people are not very disciplined financially and that reduction on debt ratio is very beneficial for cash flow afterward. Than in consideration, I would recommend a balanced ratio of repayment and retirement investing. More so in the US market than Canadian one since our American friends do get tax benefits from having a mortgage. I would take advantage of the registered tax incentive like 401k, IRA/Roth (US) and RRSP, TFSA (Canada) before putting more in the repayment of mortgage. Now, if you are very disciplined financially, repaying your mortgage early might not be the best investment of your 'saving' money. Thing is mortgage on primary residence are usually very low interest compared to pretty much any other loan you ever can hope to get. No only that but all the gain you get on the 'unpaid' equity of your house still 100% goes to you. The interest might be deductible (in the US) as is (there are some advanced trick that can make it in Canada but that much harder to do). Also that gain is tax free for 99% of the home owners). So in effect, it's like your gaining interest on the money the bank in lending you. If the interest is close or less than the growth in value of the house, it end up 'free interest' or an actual gain in net worth over time. If you invest everything you would have used to repay the house then you are getting net growth on that as well. That called leveraging. That does imply the discipline to do so (which most people won't do). If you are maximizing the registered tax incentive investment (like those mentioned above) you also get a reduce tax (usually) on those gain. Since secured lines of credits carries higher interest, they usually are not as good for the purpose of leveraging. Some car loans can be considered good for leveraging but I would only consider that if you were buying the car anyway (i.e. paying in full vs having a very low interest loan). In some case some car loans are crazy low interest which I would be stupid not to take advantage if it was offered on the car your buying (like the 2% or lower some manufacturer do). Again though this is only if your are disciplined and INVEST the money you would use to pay the car out right. As you pointed out though, the main thing is to have a plan and stick to it. Most people don't plan and end up much worst on long term. There are many strategies than can work for different people. A good example of different simple strategies are discussed 'The Wealthy Barber' book which is a quick simple book to read. Hello. I've lost both my parents recently and am in the process of inheriting a fairly large sum of money (hundreds of thousands of dollars). In addition to processing the loss of my parents, figuring out what to do with this sum is giving me anxiety. I've looked up a fee based financial planner as that seemed prudent. I'm setup for a first appointment that is free. Sort of a get to know each other kind of thing. I cant decide if the rates after that sound reasonable or not. They charge about 220 per hour which sounds fair but they also say that they will put a financial plan together for me for $2-3 thousand dollars. Is this reasonable? I feel like I cant judge this. My folks had their retirement accounts through Northwestern Mutual who charges 1% a year on the whole portfolio. If I go with the financial planner I'm looking at I'd be breaking even in under 2 years vs if I would just stay at NM where my parents were. The plus side is that then it would only be costing me the hourly fee to meet up and make any tweaks over the next few years. Part of me feels like I should just take the time to learn this and do it myself but then the anxiety kicks in worrying that I'll make a mistake and waste some of it. Part of this is because some of the money will be in "Inherited" retirement accounts which I'm forced to pull from but counts as income. I'd hate to pull too much and find myself in a higher tax bracket for no reason. The financial planner would also help me set my goals including how to smartly pay off my mortgage, college funds for my kids, and retirement planning. I guess what Im asking is - does the financial planner seem reasonable in this situation? You would have to call around to other planners in your area to compare fees. Ultimately whether it is worth the fee comes down to the quality of the advice. Less scrupulous financial planners may steer you into investments that benefit them, for instance by getting a commission. Bad advice is not worth it at any price. 1. Will they act as a fiduciary? 2. Give some specific examples of the types of investment funds they use (ideally get the ticker symbols or exact names). Fiduciaries are legally required to put your financial interests first, whereas a non-fiduciary planner is free to invest your money in things that benefit them and hurt you. So I would be wary about working with anyone who would not agree to be a fiduciary. For the investment funds, the red flags would be mutual funds with high fees or non-traditional investment vehicles like whole life insurance or annuities. If you're not sure, you can ask in this thread. Using a financial planner is perfectly reasonable, but you need to learn this stuff either way. Both to get over your anxiety and so you are equipped to know whether the planner is doing a good job or not. And do they ALWAYS act as a fiduciary. Many claim "Oh yeah, I'm a fiduciary" without mentioning that they aren't all the time. This means they can be wearing the "I'm a fiduciary" hat at one time and the "I'm a scumbag doing things in my own interest not yours" at other times and you have zero idea which hat they're wearing at any time (protip: it's the second hat). Ask them, "Are you a fiduciary 100% of the time?" If they say no find someone else. If they say yes ask them to put it in writing. If they won't put it in writing find someone else. Someone who is a fiduciary 100% of the time should have no problem writing that they will ALWAYS act in your best interest. Here's a place to start looking for 100% fiduciaries. Click on "Tell us who you are", click on "Individual", click on "Advisors who primarily use Dimensional Funds", put in your zip code. Everyone who pops up should be a 100% fiduciary but you would still want to verify this. If you're looking for just strictly a financial planner that is only going to give you advice and not manage your money than a fee only one that charges by the hour makes sense. I've never looked into myself but it's my understanding that in general it costs somewhere between $1,000 to $2,000 to have one put together a financial plan. Just finalized the refinancing of my student loans. I was not OK with the monthly increases to my variable rate through SoFi (I re-consolidated and went with SoFi 3-4 years ago when my credit score was lower and fixed rate offerings weren't great). I'll be moving from a variable rate of 6.135% to a fixed 4.07%. So this means that it's investing time, right? My original goal was to pay off my student loans in 1-2 years. I can still commit to that pretty easily, especially if I was to apply my emergency savings in 11 months to just wipe the remaining balance. I could then work to quickly replenish that, but I don't think I want to make that move, especially if I'm looking to make career months 4-7 months from now and with this recession set to hit between sometime this year and next. Apart from my ROTH 401(K) that I'm currently contributing 16% to (My 13% + the 3% my company matches), I want come up with a strategy going forward. 1) 3-4 years from now - Aiming to have anywhere from savings of 20K - 40K towards helping my mom with down payment for new home/condo. 3) 18 - 20 years from now - accumulate a bunch of money in a separate investments/fund apart from my 401K. GOING FOR THAT EARLY RETIREMENT BABY. I would still be contributing around 15% to my existing ROTH 401K that I had started putting money into 8 years ago. I'm aware that plans can change, especially if were to get married and have kids, but as of now, this is what I'm aiming for. Once student loans are paid off apart from what's going towards 401K savings, I imagine that I could save at the very least another 10-15%. 1. They mention it several times on their website that they are fiduciary. It was one of the things that I was looking for when searching for financial planners. 2. That's a good idea. I'm hoping to end up diversified across a variety of index funds in the end. I do know I dont want to get fancy in terms of investment instruments and will definitely pull back if I'm feeling that is where I'm being pushed. Thank you. I'll make sure to ask if they always act as a fiduciary and if there are times during our meetings where they may not act as one. Also, thank you for the reassurances that this method of financial planning is indeed a thing. It makes sense to me that the big cost is putting together the plan tailored to my situation and then I can have low cost (in comparison) meetings to tweak and discuss changes. My worry was that someone convinced me that I was doing the right thing and I was gullible enough to go along. What I gather from the website is that what they will deliver to me is recommendations on what to do. In the end I'll get a big binder that is "the plan" that I will then go and execute in terms of setting up accounts and moving money. I'm sure they would do it (for a fee) but this is totally fine with me. It makes me feel that they are one step removed in a way that makes me feel more comforatable that they are not out skimming off the top somehow. Thank you for the advice and kind words everyone. Honestly if you go on some of the personal finance reddits you will get the exact same advice that a financial planner will tell you but you'll save hundreds or thousands of dollars in fees. Generally the standard advice is to put your money in a diversified mix of low cost index funds (VTSAX, VTIAX and VBTLX are the big 3 vanguard funds) There are no secret tricks or magical investments that financial planners know but regular people don't. At least ask around on various financial forums and see what they tell you and if you don't like the advice or still aren't sure what to do, then consult a financial planner. I view it as being similar to paying a personal trainer to help you get in shape. They are not going to teach you secret diet tricks or magical exercises either. They are there to be a dispassionate third party who helps you stick to the plan you agreed to. Doesn't apply here at least on the 401K. You probably never even speak to them. They just take a fee and do everything from the shadows. The problem with these 401K managers is that they don't typically or consistently beat index funds. The fact of the matter is index funds follow the market while actively managed funds are done by guess work and contain human error. Personal trainers are specifically paid to help motivate you. They're there in person always. If I cut my 401K contribution to 0% no fund manager is gonna call me and talk about why I did it. If I skip out on the gym chances are my personal trainer is gonna call me and talk to me about it. We were talking about financial planners, not hedge fund managers. The truth is long term investing isn’t as complicated as people make it out to be. If you put all of your 401K money or investing money into an S&P 500 index fund you would outperform every mutual fund and money manger year after year, while paying half the fees. This is not even an opinion. It’s a statistical fact you can verify if you look it up. Yes, you just discovered the dirty little secret of the investing world. Putting all your money in a S&P 500 index fund will almost always make you more money in the long haul. 3) Contribute the rest into a traditional 401K to lower my adjusted taxable income enough to be able to reduce the phase out of my student loan interest deduction. 3) Contribute the rest into a traditional 401K to lower my adjusted taxable income enough to be able to reduce the phase out my student loan interest deduction.